George Shearing was an Anglo-American jazz pianist who for many years led a popular jazz group that recorded for Discovery Records, MGM Records and Capitol Records. The composer of over 300 titles, he had multiple albums on the Billboard charts during the 1950s, 1960s, 1980s and 1990s. He died of heart failure on February 14, 2011 in New York City, at the age of 91. George Shearing always regarded himself as a pianist who happened to play jazz. During the 1950s and 1960s, he led one of the world's most popular jazz quintets, playing in a style he called "locked hands" and inventing a unique quintet sound derived from the combination of piano, vibraphone, electric guitar, bass, and drums. Along with the success of his quintet, Shearing made other great contributions throughout these years, including leading several small, Afro-Cuban jazz combos in the 1950s. Vibraphonist/percussionist Cal Tjader, along with esteemed congueros like Mongo Santamaria, Willie Bobo, and Armando Peraza, all played with Shearing's Latin-influenced bands. Throughout his career as a soloist, fellow pianists admired his light, refined touch, and though he developed his own unique style, Shearing claimed both the great boogie-woogie pianists and classical players as prominent influences. 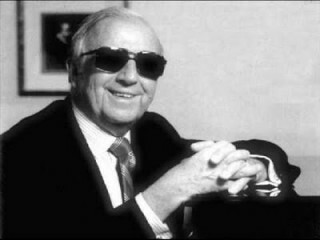 A prolific composer, Shearing wrote over 300 pieces over the course of his lifetime, including the classic "Lullaby of Birdland," which became a jazz standard. -George Shearing Quintet ,Discovery, 1949. -Lullaby of Birdland ,Verve, 1949. -You're Hearing the George Shearing Quartet MGM, 1950. -Touch of Genius ,MGM, 1951. -The Shearing Spell ,Capitol, 1955. -Shearing in Hi Fi ,MGM, 1955. -White Satin & Black Satin ,Capitol, 1956. -Shearing on Stage ,Capitol, 1957. -In the Night ,Capitol, 1957. -On the Sunny Side of the Strip ,Capitol, 1959. -San Francisco Scene ,Capitol, 1960. -The Swingin's Mutual ,Capitol, 1960. -George Shearing and the Montgomery Brothers, Jazzland, 1961; reissued, Original Jazz Classics, 1989. -Jazz Moments ,Capitol, 1962;reissued, Blue Note ,1995. -Nat "King" Cole Sings/George Shearing Plays ,Capitol, 1962; reissued, Capitol, 1991. -Shearing Bossa Nova ,Capitol, 1962. -Soft and Silky ,MGM, 1962. -Old Gold and Ivory ,Capitol, 1963. -Out of the Woods ,Capitol, 1964. -That Fresh Feeling ,Capitol, 1966. -Out of This World ,Sheba, 1970. -The George Shearing Quartet , Sheba, 1972. -The George Shearing Trio, Vol. 1 , Sheba, 1973. -Light Airy and Swinging ,MPS, 1974. -Blues Alley Jazz ,Concord Jazz, 1980. -Two for the Road ,Concord, 1980. -Alone Together ,Concord Jazz, 1981. -An Evening with George Shearing and Mel Tormé Concord Jazz, 1982. -First Edition ,Concord Jazz, 1982. -Live at the Cafe Carlyle ,Concord Jazz, 1984. -Grand Piano ,Concord Jazz, 1985. -George Shearing and Barry Tuckwell Play the Music of Cole Porter , Concord Concerto, 1986. -Breakin' Out ,Concord Jazz, 1987. -More Grand Piano ,Concord Jazz, 1987. -In Dixieland ,Concord Jazz, 1989. -The Spirit of 176 ,Concord Jazz, 1989. -(With Mel Tormé) Mel and George "Do" World War II , Concord Jazz, 1991. -I Hear a Rhapsody: Live at the Blue Note ,Telarc, 1992. -Midnight on Cloud 69 ,Savoy, 1993. -My Ship , Verve, 1994. -That Shearing Sound , Telarc, 1994. -Walkin': Live at the Blue Note , Telarc, 1995. -The Best of George Shearing ,Capitol, 1995. -The Best of George Shearing, Vol. 2 , Capitol, 1997. -Favorite Things , Telarc, 1997. View the full website biography of George Shearing .